This year we have 2 director positions whose 2 year terms of office ends and we currently also have 1 director position that is vacant. Additional nominations for these 3 positions will be accepted from the floor. KJC is proud to offer Israeli dancing lessons on Monday evenings from 7:00-8:00pm at Beth Israel (116 Centre St.) All ages and abilities are welcome to join these fun, relaxing lessons, taught by Jackie Mills. Jackie has over 30 years of experience teaching Israeli and International Folk Dance, with a focus on classic and children’s Israeli dance. Please email israelidancing@jewishkingston.org to confirm class dates. 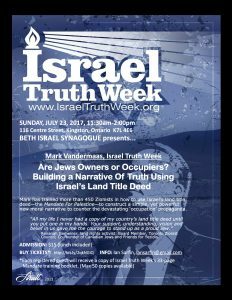 Mark Vandermaas from Israel Truth Week will be talking about building a Narrative of truth using Israel’s Land Title Deed with regards to the question of Israel as an owner or occupier of land. On behalf of the Jewish National Fund, I wanted to thank everyone in the Kingston Jewish community for their participation in the Yom HaZikaron (Remembrance Day) / Yom HaAtzmaut (Israel Independence Day) evening, and making it a memorable and celebratory event! I am also happy to share some photos with you at https://www.facebook.com/jnfregionalontario/ . As we celebrated Israel on its 69th anniversary of independence, we were so delighted to have Sara Vered describe Israeli youth fighting for their homeland in 1948. Selected as only one of 10 radio operators from her communications unit in the Hagannah, she risked her life for her country. It is amazing to hear that story first hand. She made the trip from Ottawa (thanks to daughter-in-law Liz Vered) because it is especially important to her that our youth know how important Israel is to the Jewish people. Thank you to Geoffrey Clarfield who gave great insight into the importance of the Balfour Declaration. Now 100 years later, the Balfour Declaration is recognized by international law as the legal basis for Israel’s right to exist. 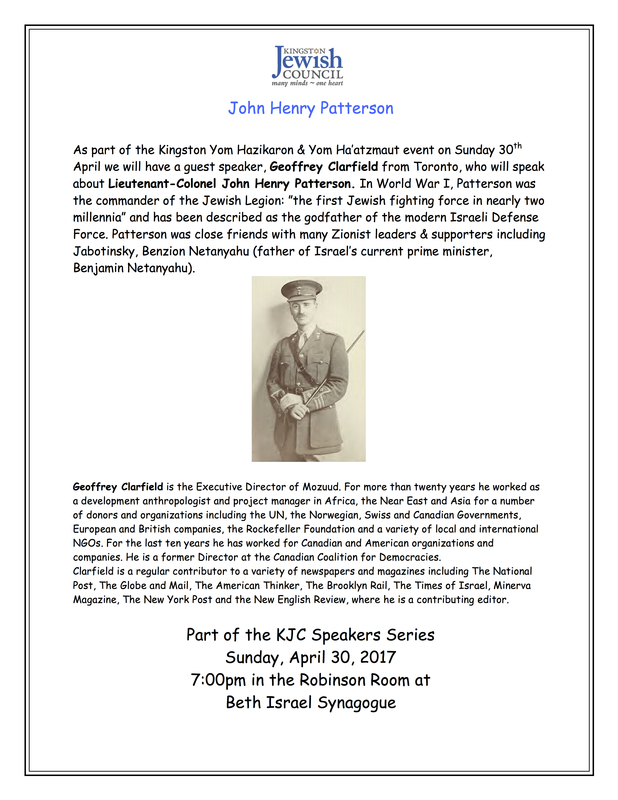 Mr. Clarfield also spoke after dinner about Lt. Col. John Henry Patterson, known as the g-dfather of the first Jewish fighting legion. Mr. Clarfield is Project Director of “Canadians for Balfour 100”. For more information, go to www.CanadiansforBalfour100.org, or about his talk see http://www.newenglishreview.org/blog_direct_link.cfm/blog_id/65263. As part of the Yom HaZikaron commemoration, Mr. Clarfield lit a memorial candle for the “past” and our roots, I was honoured to light one for the “present” on behalf of JNF and its ongoing work in Israel and in the diaspora, and Mrs. Vered lit one for the “future” as we recognized the hard work and philanthropy of Sara and her husband Ze’ev (z’l) in the fields of medicine, education, and the arts to make a better future for so many people in both Canada and Israel. Sara was joined by her granddaughter Jordana Vered, “L’dor va’dor”, after which Ian read names of fallen Canadian Jewish soldiers. Thanks to Roslyn Schwartz and her choir, as well as the children from Bader Elkin Talmud Torah and Iyr Hamelech, for their lovely songs about Jerusalem and Israel during the commemoration and after. As guests passed through the “Yerushalayim 50” balloon-banner and posters explaining the significance of the Reunification of Jerusalem and the Lion’s Gate, it was also lovely to be welcomed by the choir and children singing and waving Canadian and Israeli flags in honour of “Canada at 150”, as a symbol of the friendship between our two countries. Thank you to Sarah Springer and Ezra Poplove for their summaries on reunification too. Thank you to Jackie Mills who lead the “frailich” and fun Israeli dancing and for organizing the lovely Israeli music. Thank you to Michael George who, along with Melissa Greenberg, created the impressive and symbolic floor-to-ceiling Lion’s Gate wall for all to admire. Thank you to Janine Fabri for the balloon bouquets. 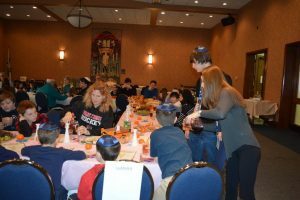 Thank you to Melissa, with help from Michael Springer and Alan Cohen, for creating the “Kotel” centerpieces with glowing turquoise lights, as well as Canadian and Israeli flags. Thank you to all the children who participated in the Israel “Jerusalem sites” contest! The children seemed pleased to receive their JNF prizes of Jerusalem art and bookmarks. We will be adding contest photos to our website under “Regional” soon. Thanks to Leanne Lieberman at IHM for her and her school’s support. Thank you for the delicious Israeli and Canadian food by IMS Catering. There were even “beaver tails”! Thank you to Wanda Couling for helping to publicize this, and Chris Taylor for all his help with set-up and take-down. Thank you to Melissa and Michael Springer for sponsoring the flowers straight from Israel in honour of the day and our speakers Sara, Geoffrey and myself. As Melissa remarked at the event, two people were especially missed because they have for many years been so connected to these celebrations: Frank Simkevitz (z’l) whom I replaced as JNF’s Regional Executive Director, and Uri Fixman (z’l) whose beautiful baritone voice brought such strength to the choir. Frank is being honoured at a Gala Negev dinner in London on June 11th. If anyone wishes to donate in his memory, please contact Roberta Katz at JNF Regional 1-866-527-5516 extension 1. Thank you to committee members, Ros, Jackie, Gloria Pivnick, Debbie Fitzerman, Lisa Cassidy, Ashira Prizant and Zack Babins from Hillel, organizers JNF Chair Melissa Greenberg and KJC President Ian Sarfin, and sponsors Kingston Jewish Council, Jewish National Fund, Queen’s Hillel and the Delta by Marriott Waterfront Hotel, as well as Iyr Hamelech and Beth Israel Congregations. I was also glad for the opportunity to speak about the work of the Jewish National Fund, how it has evolved since 1901, and how it remains relevant and vital today. If anyone would like more information, please go to www.jnf.ca. It is truly rewarding to see the community coming together in celebration! L’Hitraot! 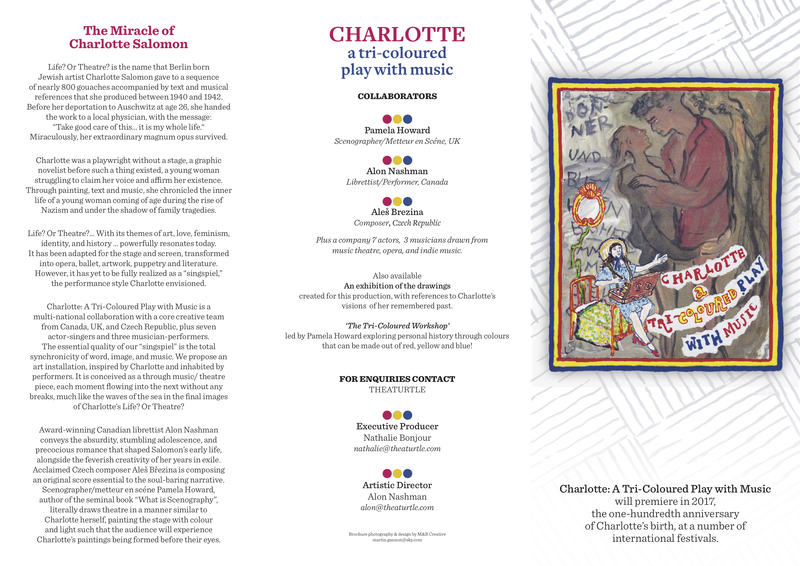 CHARLOTTE: A Tri-Coloured Play with Music is a new chamber musical inspired by Charlotte Salomon’s autobiographical masterpiece “Life? 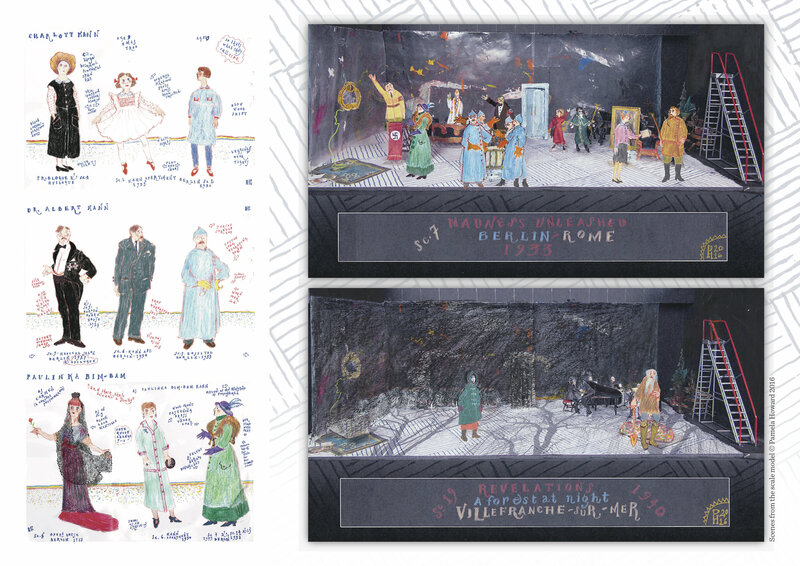 Or Theatre?”, her series of 760 paintings which form what could be called the first graphic novel. The play is a Canadian initiated international collaboration, with music by acclaimed Czech composer Aleš Brezina, and direction and scenography by UK-based Pamela Howard. Charlotte is being created by Toronto’s genre-bending Theaturtle. CHARLOTTE will have a residency as part of the Innovator’s Series at the Isabel Bader Centre for the Arts, where it will face it’s first audience in a concert version. The production will also travel to Toronto’s Luminato Festival, and World Stage Design Festival in Taipei. 2017 is the centenary of the Charlotte Salomon’s birth, and a year when we remember the effects of war, displacement and genocide. Her story resonates loudly today as a testament to power of art, passion, perseverance and hope in the face of tyranny. Please, have a look at this short video, and the material below. A genre-bending chamber musical which brings to life Charlotte Salomon’s extraordinary autobiographical artwork. For more on the production, have a look at this article in the UK journal Jewish Renaissance. Chabad will be hosting an all-night Torah-study session Tuesday night, May 30 starting at 10pm, in preparation for the giving of the Torah! Join as we delve into the deepest parts of the Torah (that they never taught in Hebrew School! ), the significance of the number 3 and the Talmudic passage recounting the story of Mount Sinai. 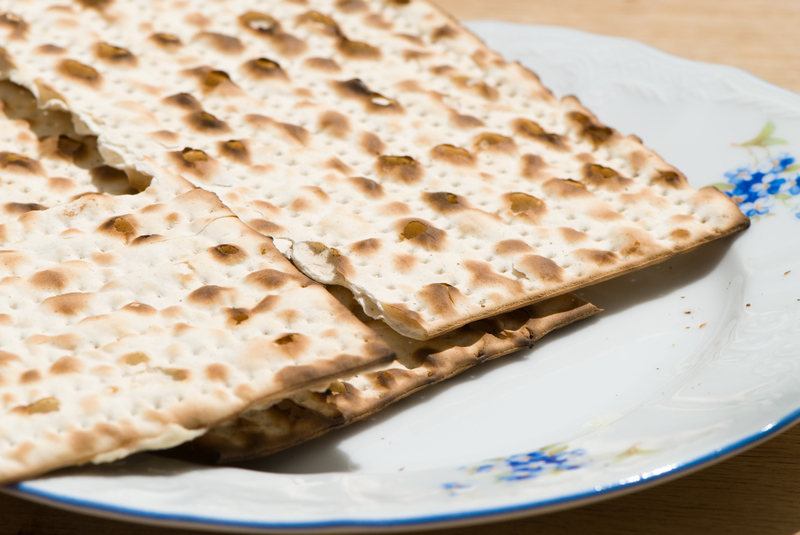 Join us together with family and friends on the first day of Shavuot, Wednesday May 31, at 4:30pm for the reading of the 10 Commandments followed by a scrumptious Shavuot dairy feast. You will be treated to a special Ice Cream Party – Ten Commandments, Ten Toppings. I asked Lisa to delay sending out our monthly newsletter this month until after the Yom Hazikaron and Yom Ha’Atzmaut events so that we could share with everyone especially those who could not attend the content of the 3 speakers we had over the two days. On Sunday the 30th April we started our celebrations by paying tribute and remembering the 23,544 Israeli Soldiers that gave the ultimate sacrifice of their lives defending the State of Israel. Hearing about the story and plight of the Yazidi’s was very moving and for those who could not attend I encourage you to visit Mozuud’s website and hopefully we as a community can come together to help this very worthwhile cause. If anyone is interested in spearheading this initiative please contact me at president@jewishkingston.org or call me at 613-531-1746. KJC looks forward to continue to work with Geoffrey and the organizations he represents which are Mozuud.org, Speakers action group & Canadians for Balfour 100. Stay tuned and visit our website for information on additional speakers we are looking at bringing to Kingston. 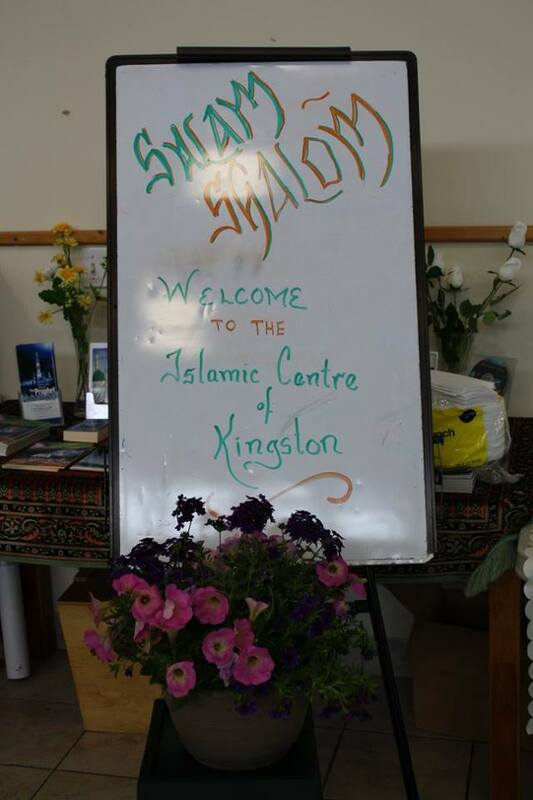 On Sunday April 30th, about 30 women from the Jewish and Muslim communities got together to have a potluck brunch hosted at the Kingston Islamic Centre. 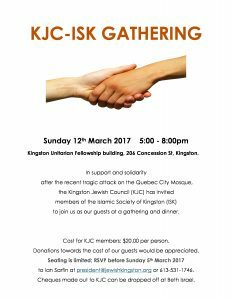 The potluck came about after our initial supper on March 12th hosted by the KJC to show solidarity with the Muslim community after the shooting in Ste Foy/Quebec City. A number of women connected with each other and wanted to keep the momentum going by creating regular events to foster relationships and dialogue. Since food is a common denominator, a potluck seemed like the best way to connect. We all brought dishes, many from our respective countries of origin, listed our recipes to share, and connected over food. Once the food was set up, Eram and Debbie (our amazing event organizers) said a few words, along with Erum who talked about the importance of creating a safe space for dialogue and discussion to learn about our similarities and differences, as well as what it means to be Muslim and Jewish women in our society. 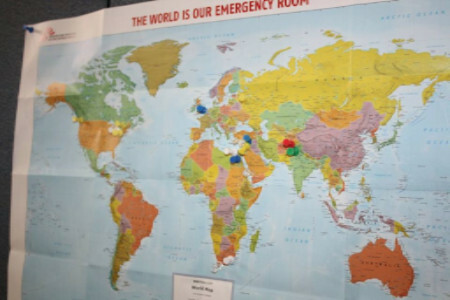 Eram and Debbie had set up a world map for people to put pins in the countries they are originally from as well as an idea board. Aside from food and conversation, our main activity was to identify our next steps to make sure we generated ideas to meet on a regular basis. With many great ideas floating around, we decided on a BBQ in July. The reality is that as a group we didn’t need any extra activities or ice breakers. Everyone was friendly, talkative, and warm from the start. 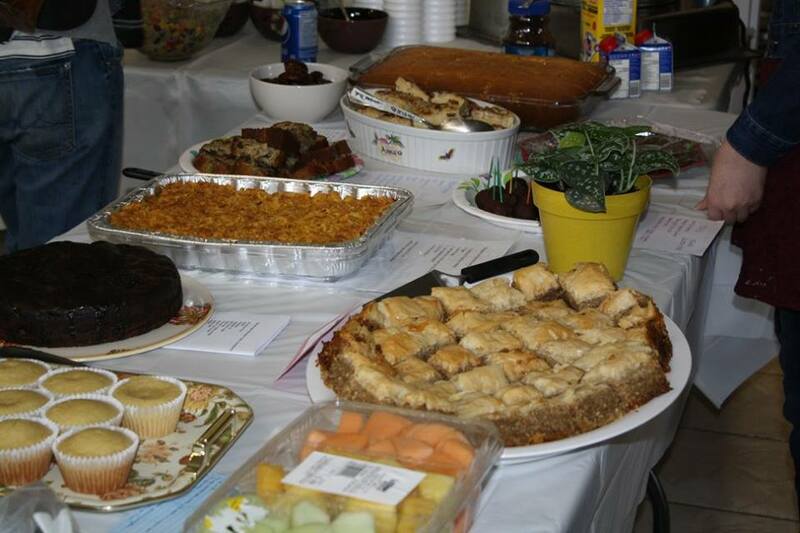 Some people got a real kick out of having the recipes and being able to try kugel and pakoras at the same sitting. I ate brunch with women from Indonesia and Pakistan who talked about some of the cultural differences and how their children experienced things differently being born in Canada. We talked about food, how similar our religions are, some of the differences, our families, and how our outlook on food provides a common denominator. Overall, I think these types of connections are important as we continue to develop relationships with members of other religious and minority groups throughout Kingston. CHARLOTTE can be seen in its first ever public presentation in Kingston on Thursday June 1, at 7:30pm. See The Isabel website for details and tickets. After a slow start to the year KJC programing is now in full swing with many great events and programs planned. All our newsletters will be available online so no matter where you are you can access them. March started off with a very successful fundraising Theater Night at the Domino Theater. We had 90 people come out and see John Lazarus’s “The Village of Idiots” which was followed by a Q&A with John. I would like to thank everyone who came out to see the play. This was followed by a joint dinner gathering on Sunday 12th March with members of Kingston Jewish Council (KJC) and The Islamic Society of Kingston (ISK) firstly to show our support and solidarity with the Kingston Muslim community after the horrific terrorist attack on the Quebec City Mosque, and secondly to start a much-needed dialogue between the Jewish and Muslim communities. We invited 30 people from each organization, ISK & KJC, to attend. We were also pleased to have our local MPP Sophie Kiwala, and members of Kingston Police diversity unit attend. The event was held at Unitarian Place (where Iyr HaMelech hold their services). The evening started with music by Dr.Roslyn Schwartz and words from Rabbi Soria and Dr Bayoumi, followed by dinner and the opportunity for people to get to know each other. Seating was arranged so tables had people from both organizations sitting together. Walking through the room and hearing all the different conversations going was electric; if an outsider had walked in they would have thought everyone had known each other for years. We ended the evening with people sharing their thoughts and the overwhelming response was we need to do more of this. So, stay tuned for details on some other events with ISK as well as other interfaith and inter cultural events that will be taking place in the months to follow. The momentum from this event will not fade away but keep on rolling because we both have a lot in common and need to focus on our commonality because then we will be comfortable with and understand each other so we can openly discuss our differences as well. Last year KJC initiated meetings with members of all the Kingston Jewish organizations to also find and build on our common ground. 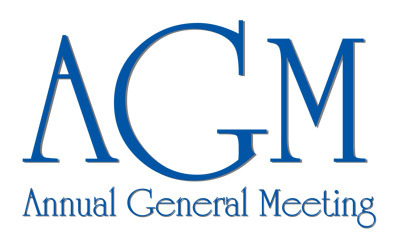 As a result of these meetings Beth Israel invited Iyr HaMelech to join them at one of their Shabbat morning services last year and on 8th April this year Iyr HaMelech is inviting Beth Israel to join them for a Shabbat morning service. After Pesach, we will have a Yom HaShoah event on 23rd April, followed by Yom Hazikaron & Yom Ha’Atzmaut on 30th April. 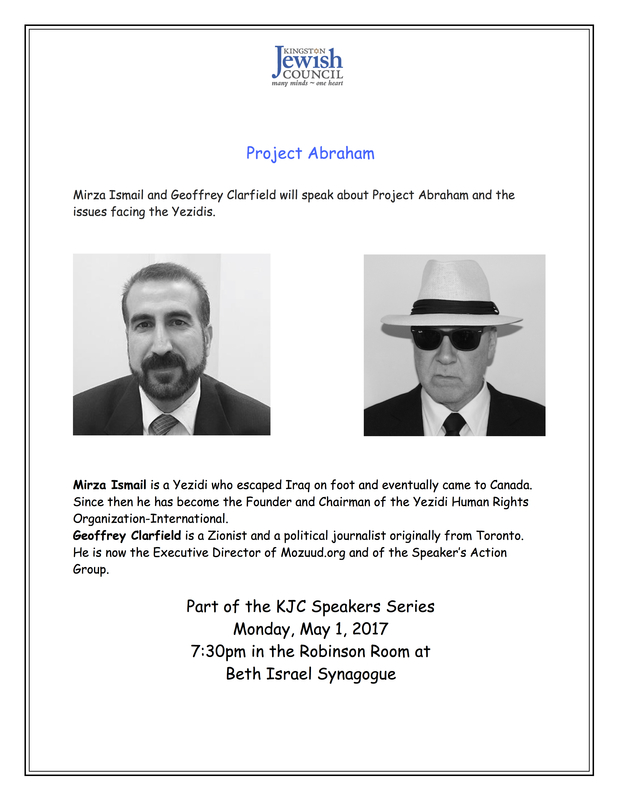 1st May we have a Speaker’s Series where we will hear about Project Abraham and the genocide that the Yezidi people have endured. Several other speakers are also planned so watch the website for details. 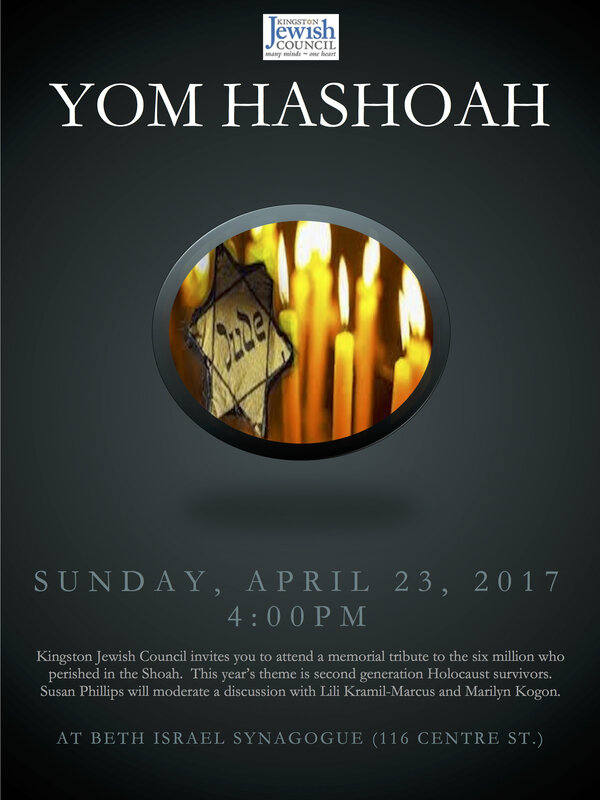 April 23 2017 at 4:00pm – A memorial tribute to the six million who perished in the Shoah This year’s theme is second generation Holocaust survivors. Susan Phillips will moderate a discussion with Lili Kramil-Marcus and Marilyn Kogon. 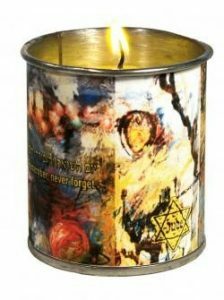 This year we will also have Yellow Memorial Candles specifically for Yom Hashoah. 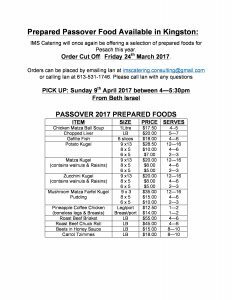 These are available by contacting Ian Sarfin at president@jewishkingston.org. Donations for the candles will be accepted to help offset costs. 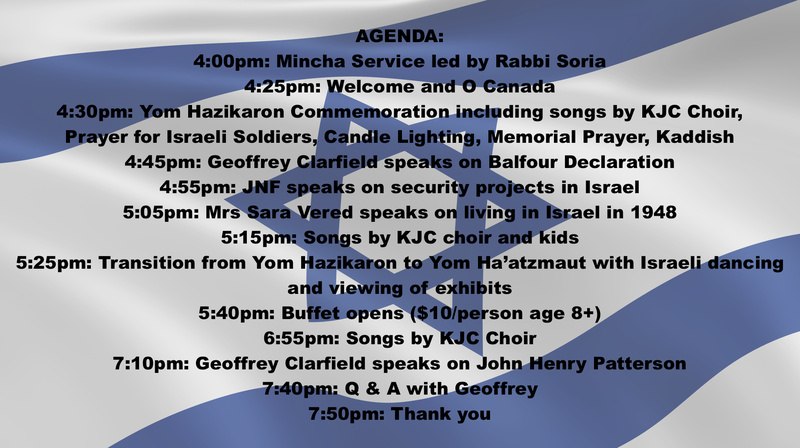 April 30 2017 at 4:00pm – The Kingston Jewish Council, the Jewish National Fund, and Queen’s Hillel invite you to celebrate Yom HaAtzmaut on Sunday, April 30th, to commemorate Israel’s 69th birthday, Canada at 150, the 100th anniversary of the Balfour Declaration and the 50th anniversary of the reunification of Jerusalem! Learn about the new Kingston JNF project! Join us first for the Yom HaZikaron memorial service, as the KJC Choir, along with the Beth Israel and Iyr HaMelech children, lead us in paying tribute to Israel’s fallen. An additional program will include fascinating speakers on the early history of pre-state Israel, in honour of the 100th anniversary of Britain’s Balfour Declaration. Then we walk through the “Lions Gate” to begin the party with Israeli and Canadian music, dancing, and food! Delicious falafel, shwarma, and other special foods will be available for $10/person (ages 8+). Exhibits and displays will highlight the relationship between Canada and Israel, and the ongoing partnerships reflecting shared values, past present and future. Student projects will focus on Jerusalem and its place in our hearts and minds. Exhibits, displays, and more will be available for viewing through Tuesday, May 2nd. I am very pleased to announce that the new KJC website is now live and I encourage everyone to look at it at www.jewishkingston.org. 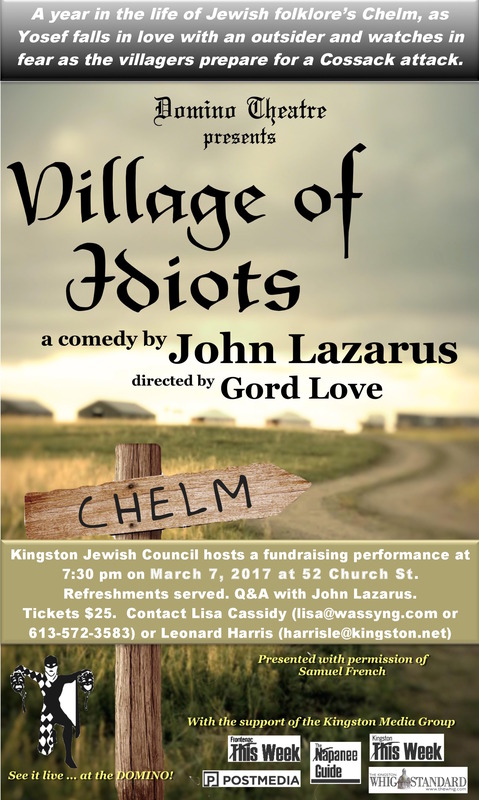 Going forward, this will be the place to go for the most updated information about KJC and other Jewish events in Kingston. 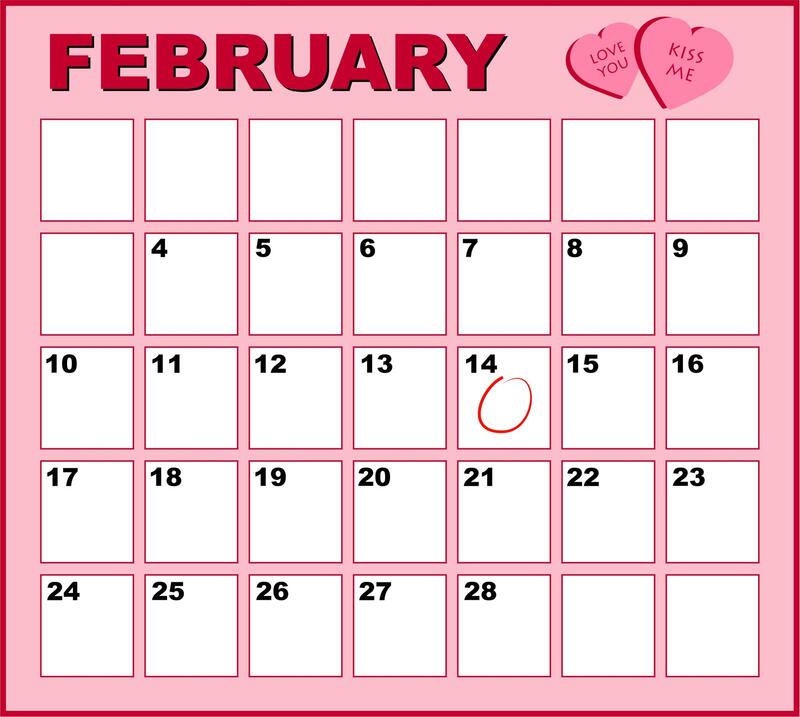 Moving forward, we are aiming to make the calendar on the site a community one with info about all Kingston Jewish Events in one place. Anyone wishing to add an event to the calendar should contact Lisa Cassidy, our KJC program coordinator, at coordinator@jewishkingston.org. Lisa can also be contacted if you have any information you would like to have posted on the site. Anti-Semitic incidents in Kingston: Unfortunately over the past few weeks there have been a number of Anti-Semitic incidents occurring in Kingston, on the military base and involving some military personnel. These incidents have been reported to the Military Police who are investigating, and they have also been reported to Bnai Brith and I have contacted the Commander of CFB Kingston to inform him of these incidents. I will also be letting the City Police hate crime unit know. I urge anyone who is on the receiving end of anything Anti-Semitic or knows about any incidents to let me know by phone 613-531-1746 or email at president@jewishkingston.org so that these incidents can be correctly reported and documented. No matter how large or small the incident is, we can’t allow them to be ignored. 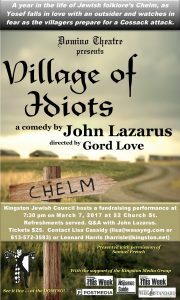 7:30pm on March 7 2017 – a special fundraiser performance of “The Village of Idiots” by John Lazarus, who will have a Q & A session after the performance. April 23 2017 – annual Yom Hashoah Remembrance Program. This year we will also have Yellow Memorial Candles specifically for Yom Hashoah. 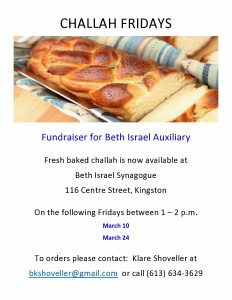 These are available by contacting Ian Sarfin at president@jewishkingston.org. Donations for the candles will be accepted to help offset costs. 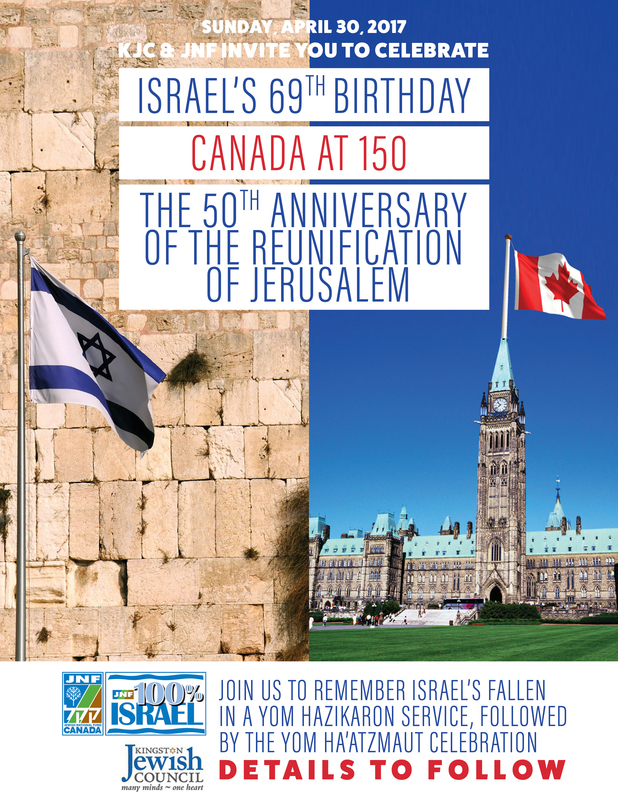 April 30 2017 – The Kingston Jewish Council, the Jewish National Fund, and Queen’s Hillel invite you to celebrate Yom HaAtzmaut on Sunday, April 30th, to commemorate Israel’s 69th birthday, Canada at 150, and the 50th anniversary of the reunification of Jerusalem! Learn about the new Kingston JNF project! Then we walk through the “Lions Gate” to begin the party with Israeli and Canadian music, dancing, and food! Delicious falafel, shwarma, and other special foods will be available for $10. Exhibits and displays will highlight the relationship between Canada and Israel, and the ongoing partnerships reflecting shared values, past present and future. Student projects will focus on Jerusalem and its place in our hearts and minds. More information and details to follow – come join the party! Jewish Luck (USSR, 1925) Based on stories by Sholem Aleichem. Directed by Aleksei Granovskii. Starring Solomon Mikhoels, Tamara Adelgeim, Moyshe Goldblat. Return of Nathan Becker (USSR, 1932) Written by Peretz Markish. Directed by Boris Shpis and Rachel Milman. Starring Solomon Mikhoels, David Gutman, Boris Babochkin. This rare, newly restored feature was originally advertised as “the first Yiddish talkie from Soviet Russia.” The plot centers on Nathan Becker, a Jewish bricklayer who returns to Russia after 28 years in America. After reuniting with his father (played with comic eccentricity by Solomon Mikhoels) Nathan leaves the shtetl to work in the new industrial center of Magnitogorsk. There, he and his African-American friend Jim soon find that the work habits they acquired in America that helped them to “build New York together” conflict with the Soviet system. While the film’s resolution emphasizes the triumph of socialist productivity, the screenplay by Yiddish author Peretz Markish reflects the warmth and humor of the Jewish spirit. 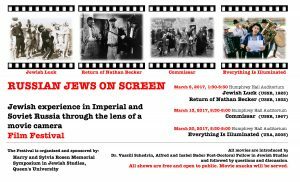 Return of Nathan Becker is the only Russian Yiddish sound feature film produced in the Soviet Union and was made for domestic consumption as well as for export to the United States. Commissar, commemorating the 50th anniversary of the October Revolution, tells the story from the period of the Russian Civil War (1918–1922), when a female commissar of the Red Army cavalry Klavdia Vavilova (Nonna Mordyukova) finds herself pregnant. Until her child is born, she is forced to stay with the family of a poor Jewish blacksmith. Vavilova seemingly embraces motherhood, civilian life, and new friends. Meanwhile, the frontline advances closer to the town and the Jews expect a pogrom by the White Army as the Red Army retreats. Vavilova attempts to console them with a Communist dream: “One day people will work in peace and harmony,” but the dream is interrupted with a vision of the fate of the Jews in the coming world war. Soviet censorship was outraged by the film. As a result, its director Aleksandr Askoldov was banned from the profession for life and was told that the single copy of the film had been destroyed. Everything Is Illuminated (USA, 2005) Adapted from the novel by Jonathan Safran Foer. Directed by Liev Schreiber. Starring Elijah Wood, Eugene Hutz, Boris Leskin. Please call me for assistance, or to make arrangements for pick-up. Why travel to Israel with JNF? For an example of a few of our upcoming trips, click on this link. Call our office if you are interested in hearing about the type of trip that is of interest to you! A huge Todah Rabah and Thank You to Noa Friedman, the Educational Shlicha from the Jewish National Fund for visiting our community this past Sunday (February 26th) at Beth Israel, and leading a wonderful Tu BiShevat program that was informative and fun for all ages. It was our pleasure to welcome her husband Ofer and beautiful children too. Thank you to all of our helpers Kristina Franklin, Anna Bona, Stacey Reed, Jordan Cohen, Kyriana Bromberg, Gwynneth Dyzak, and Sarah, Daniella, Juliana and Samanntha Springer for purchasing our delicious Israeli “species”, setting tables decorations, pouring wine to resemble the changing seasons, and helping children make magnets and plant. Your parsley should be sprouting soon, in time for Pesach! Anna Frankel, Leanne Lieberman, Lisa Cassidy, and Melissa Greenberg (as well as Suzy Polgar and Geraldine Katz-Rose at JNF) were delighted to have a great turn out from both schools! This year’s Tu BiShevat campaign will raise money for the Western Negev Security Plantings, planting trees along the roads and around the Israeli communities in the western Negev. The citizens of these communities live under the constant threat of sniper fire and rocket attacks from within Gaza. To see video footage of the area and to understand how vital this project is, please click on this link. If you have not received a call or made a donation yet, there is still time. Purchase a tree in honour of your child or family member(s), $18 per tree, or $180 for a mature tree. Tree cards and certificates available to be sent from JNF. Please contact Roberta at Roberta.katz@jnf.ca – and give Kingston credit towards our first JNF Kingston project in the future! Residents of Kfar Aza (around 5 km from the Gaza border) speak about the importance of KKL-JNF’s security plantings for the kibbutz: Yossi Mizrahi has lived in Kfar Aza for 43 years: The threat of being targeted has significantly decreased since the plantings. Just the fact that we know that we cannot be seen, due to the presence of the trees, gives us a feeling of security. In the past, we could be observed through binoculars from not far away; our movement around the kibbutz could be tracked. Because of the trees, we are no longer spied on right into our living rooms at any given time, and we are safe and saved from being shot. Orit Braun, Community Director of Kfar Aza has lived in the kibbutz for 37 years: Any normal person would want to wake up in the morning, see their neighbors across the fence and smile with a greeting of “good morning”. Unfortunately, this simple pleasure is denied us. In response to the hostility from our neighbors, we have had no recourse but to build fences and, more recently, plant security trees. It’s sad, but we have no choice; we want to live. For us, the trees are lifesavers. We are glad, at least, that the barrier is a green, natural one that blends in with the surrounding nature. This lightens the fact that it is there to protect us from our neighbors. 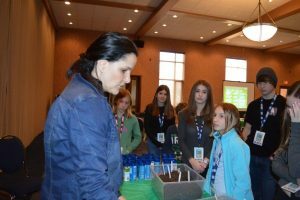 “Shlicha” Noa Friedman demonstrates how to plant parsley in recycled JNF boxes to teen helpers and students. Sarah Springer and Jordan Cohen pouring grape juice for the Tu BiShevat Seder with Beth Israel and Iyr HaMelech families. 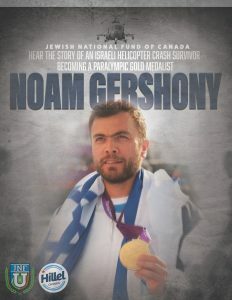 Hear the story of an Israeli Helicopter crash survivor becoming a Paralympic gold medalist. This is an amazing speaker not to be missed!! On Saturday 21st January Rabbi Soria, Debbie Fitzerman, Gloria Pivnick and I attended the third annual community Diversity Dinner on behalf of Kingston Jewish Council. It was great to be part of an event that brought together over 150 people from many different cultural and ethnic groups and organizations. The camaraderie and atmosphere in the room was truly amazing. The evening was also an opportunity to hear from Jimmy Hassan who is the CEO of the “Canadian Colours Foundation Kingston” (CCFK) that will be launched this year in Kingston, to promote diversity and multiculturalism. As soon as I receive more information I will distribute it. As President of KJC, I plan to get more involved in the various multicultural events happening in Kingston and to look at getting some dialogues going with small groups of people from the various organizations. Anybody interested in getting involved in these projects please contact me by e-mail at iansarfin@gmail.com or by phone at 613-531-1746. I plan to attend the annual Chinese New Year Pot Luck Dinner celebration on Feb 4th on behalf of KJC. Looking forward to a busy 2017! Davies Foundation Auditorium (Domino Theatre) 52 Church Street Kingston. The play’s author, John Lazarus, will have a Q & A session after the performance. This will be a fundraiser for KJC with funds raised being used towards the cost of our large Menorah which was lit for all 8 days of Hanukkah last year in Springer Market Square and will be for future years, as well as other programming we offer during the year. KJC looks forward to a great turnout for this event! During her talk on November 11, Ellin Bessner passed an artifact book around the room for attendees to look at; that book is missing. 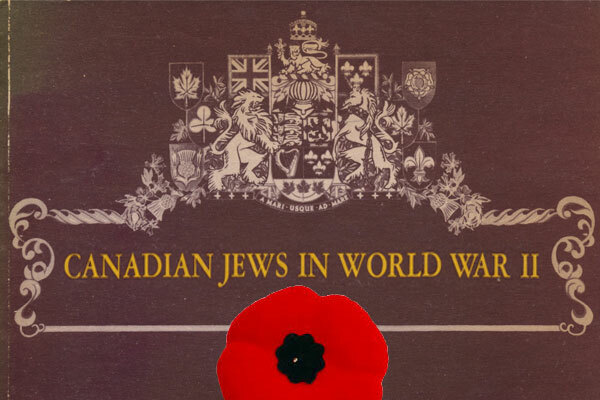 It is a brown soft cover booked titled “Canadian Jews in World War II, Part 1 Decorations” that looks like the image below without the poppy. If you have the book or know where it might be, please drop it off at Beth Israel to the attention of Ian Sarfin. As we get ready to start the year 5777 we need to reflect on how we can make this year better than the previous ones and what is our vision for the future. As I look at the challenges facing many Jewish communities around the country large and small it is very clear to me that communities cannot continue to survive and grow if they insist on continuing to do business as they have in the past. I believe that this applies to our Kingston Jewish Community as well. That is why as the new President of Kingston Jewish Council I plan to be a driving force in reaching out to the greater Kingston Jewish Community in the hope of bringing them together to celebrate as many Jewish events as possible as one large family regardless of our religious or political affiliation, instead of at a number of smaller events. I will continue to reach out to all the Kingston Jewish organizations in an effort to find as much common ground as possible and work with them to offer a broad spectrum of programming that will be appealing to a wider portion of the community and attract all ages. The Kingston Jewish community is very fortunate that Beth Israel Congregation has such a wonderful Building and I believe it is time to start looking at that building becoming the centre of everything Jewish in Kingston and one day become the home of the Kingston Jewish Community Centre that is actively used by home of all Kingston Jewish organization. Wishing everyone a year filled with peace, good health and happiness. Can you spare an hour of your time a month for a worthy cause? The Soul Food program transports left-over food from the Queen’s University cafeteria to local shelters six nights per week. The program needs volunteer drivers. If you can help one evening a week, or one evening a month, please contact Leonard at harrisle@kingston.net. If your contact information has changed/will change shortly, please notify us at info@jewishkingston.org to ensure you continue to receive our emails in future. Rosh Hashanah begins at sundown on Sunday October 2 and ends at sundown on Tuesday October 4. 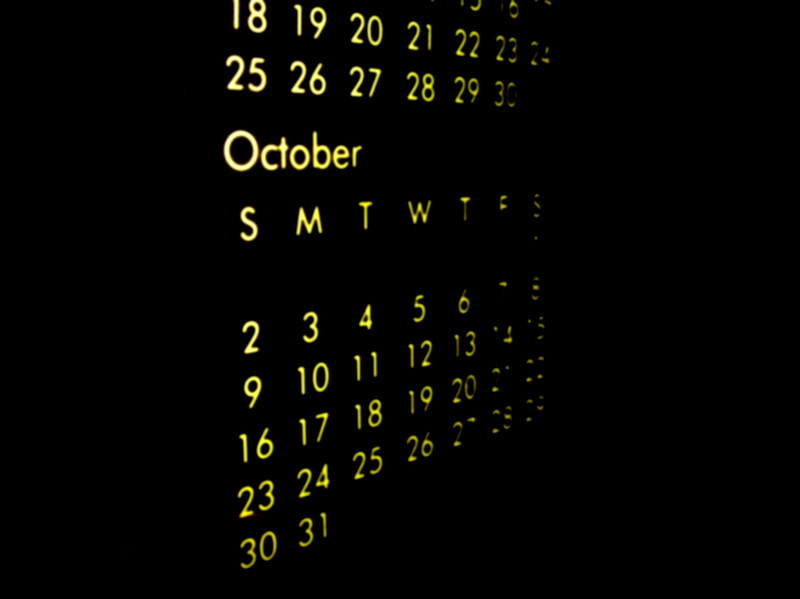 Yom Kippur begins at sundown on Tuesday October 11 and ends at sundown on Wednesday October 12. 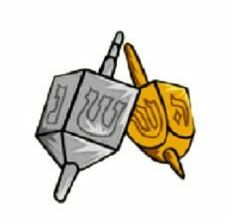 L’Shana Tova! 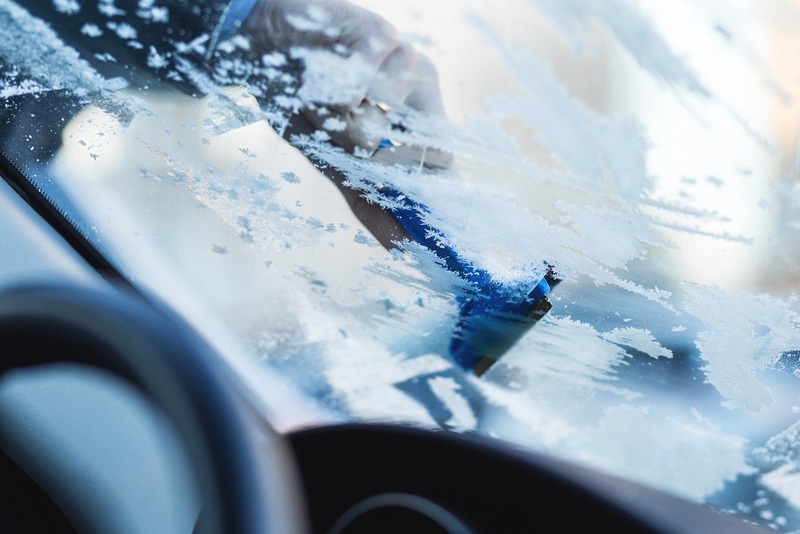 **Remember to adhere to City parking regulations during weekday services. We are getting ready for the New Year at Chabad! Come join us for traditional High Holiday Services. Popular songs with inspiring Rosh Hashanah messages will be interspersed throughout the prayer. There is no charge and all are welcome. A place to celebrate the High Holidays with friends and good company, Chabad provides you with many opportunities to ensure that your holidays are as meaningful as possible! October 3rd: Prayer services @ Chabad 251 Brock St. (corner of Clergy) 9:30am- 1pm – YomTov Lunch to follow. October 4th: Prayer services @ Chabad 9:30am-1pm – YomTov Lunch to follow. Make sure to hear the Shofar! Make this Yom Kippur extra meaningful where the timeless themes of Yom Kippur are imbedded throughout the prayer. Popular songs with inspiring Rosh Hashanah messages will be interspersed throughout the prayer. There is no charge and all are welcome. Presented in partnership with Anne Frank House, Amsterdam through the generous sponsorship of anonymous donors. Anne Frank’s story continues to resonate with people around the world, and is revealed through images and words in Anne Frank – A History for Today. While the exhibition focuses on one particular family’s experience during the Holocaust, the story is universal and encourages visitors to consider the effects of prejudice, discrimination, exclusion and violence. Open to all ages. Recommended for adults and youth in grades 5 and up. These events will be held within the exhibition space. Visitors who wish to view the panels are encouraged to arrive early. The Kingston Jewish Community Choir, Dolce Trio and pianist Clare Gordon will perform a selection of classical and Hebrew pieces in a musical evening of remembrance. Jochebed Katan, a Holocaust survivor, will share her remarkable story. Jochebed was born during the war, very close to Anne’s Secret Annex. Her family was preserved through sacrifice and courage. Tuesday, Wednesday and Thursday mornings have been reserved for visits by local schools. Please contact annefrank.kingston@gmail.com for more information. Please place your order by emailing janespringer@live.com by the Wednesday before. JEWISH NATIONAL FUND, REGIONAL ONTARIO WISHES YOU AND YOUR LOVED ONES A VERY HAPPY, HEALTHY NEW YEAR! For the upcoming holidays, send good wishes to a loved one with a JNF High Holiday card. By donating to JNF you link your greeting and the name of the recipient with the historic effort to build the Jewish land. Click here to select a card and call the JNF office at 1-866-527-5516, xt 4 for us to send cards out for you! JOIN JNF’S SMALL COMMUNITY MISSION TO ISRAEL THIS MARCH! Members of some of the smaller communities across the country are getting together in Israel for a one-of-a-kind trip. Click here for information on the itinerary, costs and how to join! Go to Israel the JNF way!